A comprehensive review of two decades of economic research on the minimum wage by economists David Neumark (University of California—Irvine) and William Wascher (Federal Reserve Board) concludes that increases in the minimum wage reduce job opportunities for the least-skilled workers. As a consequence of this inconvenient truth, advocates of a higher minimum wage have increasingly leaned on alternate arguments to make the case for additional employer mandates. Increases in the minimum wage have been sold as a stimulus or a “shot in the arm” for both state economies and the U.S. economy as a whole. These claims have rhetorical appeal, especially in a troubled economic environment where policymakers are desperate for a quick fix. The problem for those taking that line of argument is that no hard evidence exists to confirm whether or not a higher minimum wage really helps the economy. Existing research tends to take a bird’s-eye view of business growth. Comparing industry-specific employment growth in states with a lower federal minimum against those states with a higher statutory wage, these studies are problematic and unreliable because they don’t control for state-specific demographic or economic trends. In this new study, Dr. Joseph J. Sabia (United States Military Academy at West Point) uses data from the Census Bureau and the Bureau of Economic Analysis to measure the Gross Domestic Product (GDP) and employment response associated with an increase in the minimum wage. Sabia shows that increases in the minimum wage can actually have a negative effect on GDP—specifically, GDP generated by lower-skilled industries. Sabia first examines whether increases in State and Federal minimum wages between 1997 and 2007 have decreased low-skilled employment (defined here as the employment-to-population ratio for 16-to-19 year-olds). Controlling for economic performance and other unmeasured state employment trends, Sabia finds that each 10 percent increase in a state’s minimum wage decreased employment for the group by 3.6 percent. And because these employment losses were not accompanied by an increase in school enrollment, they suggest that job loss caused by wage hikes is not offset by long-term productivity gains. After determining that increases in states minimum wages did decrease employment, Sabia looks at data on economic growth to determine whether job loss associated with a higher minimum wage has had a negative impact on GDP; he focuses specifically on GDP generated by those industries affected most by minimum wage increases. This includes low-skilled industries like wholesale trade, manufacturing of durables, warehousing and storage, rental and leasing services, and administrative and waste services. Sabia finds that each 10 percent increase in the minimum wage is associated with a two to four percent decline in state GDP generated by these lower-skilled industries. Broadening the analysis to examine national GDP, Sabia finds that increases in the minimum wage between 1997 and 2007 had a small, insignificant negative effect on the national economy overall. This means mandated wage increases are far from the economic “shot in the arm” advocates claim them to be. This research is relevant for two reasons. Each year, states across the country increase their minimum wages, or consider legislation to do so. 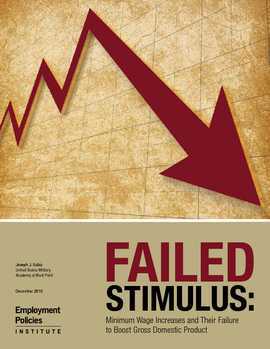 Sabia’s findings suggest that these policies are unwise both in good and bad economic times, because of the negative employment consequences for states’ low-skilled workforce and the negative economic consequences for states’ low-skilled industries. Additionally, the research suggests that exuberant claims about the positive economic benefit of a minimum wage increase are not based on economic reality. Far from stimulating an economy, an increase in the minimum wage has no discernible impact on overall GDP and could actually hinder growth in certain low-wage sectors.